There are some words out there that are just so fun to say….. The last one is a double-winner because it’s also darn delicious and easy to make. 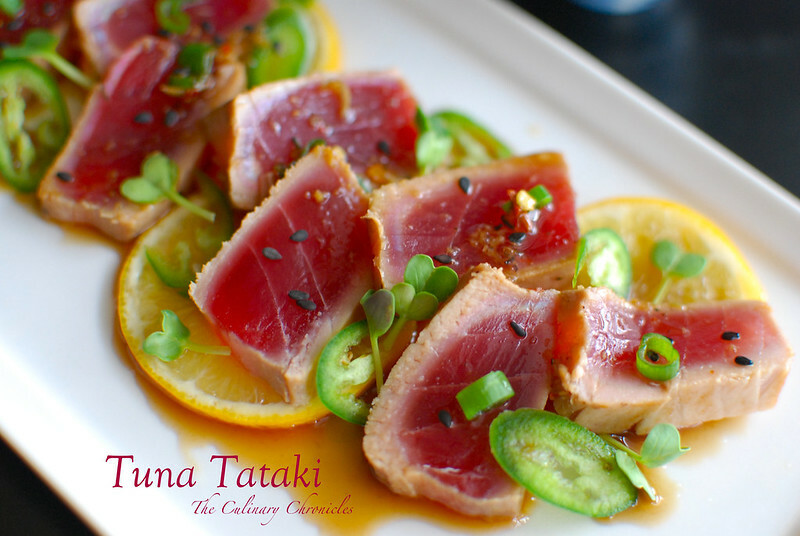 When it comes to tataki, I either go with a beef preparation or fish —or BOTH for a little surf and turf action! Either protein lends itself well for the quick sear and rare center. 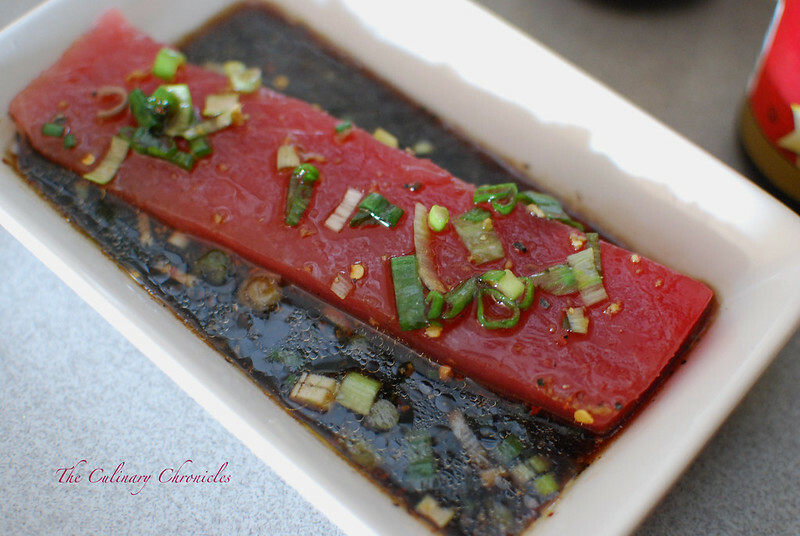 Though I do love me some ahi tuna…. 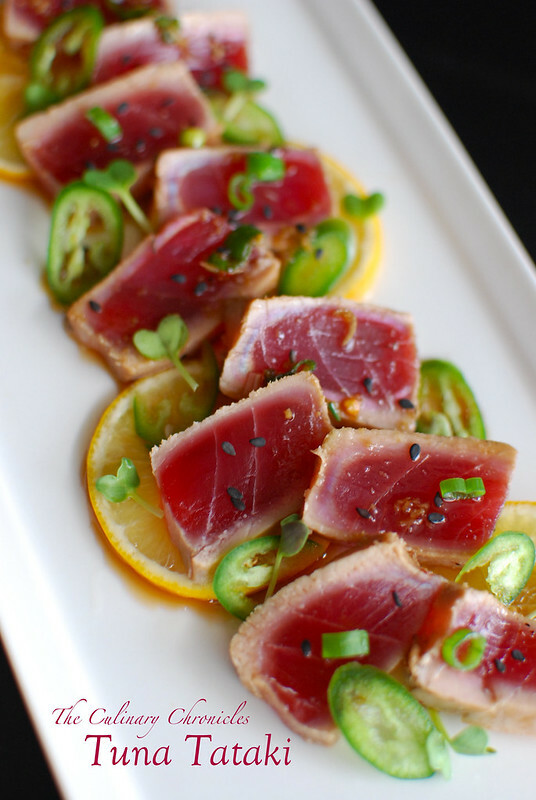 Simply pick up some beautifully fresh ahi tuna from your local fishmonger, let it marinade in lovely things like ponzu & fresh ginger— and then quickly sear it in a hot skillet. You end up with a gorgeous plate that is packed with flavor and yet still light at the same time. It’s the perfect dish for the upcoming hot summer months and can be served as an appetizer or over mixed greens for a main entree. And with that — Happy ALOHA FRIDAY!!! Once marinated, remove the tuna from the liquid and use paper towels to blot the fish dry. Heat the peanut oil in a large skillet over medium high heat. Once the skillet begins to slightly smoke, add the tuna and sear for 30-60 seconds on each side. Remove the fish and allow to rest for 5 minutes. Using a very sharp knife, cut the tuna into ¼ inch wide slices. 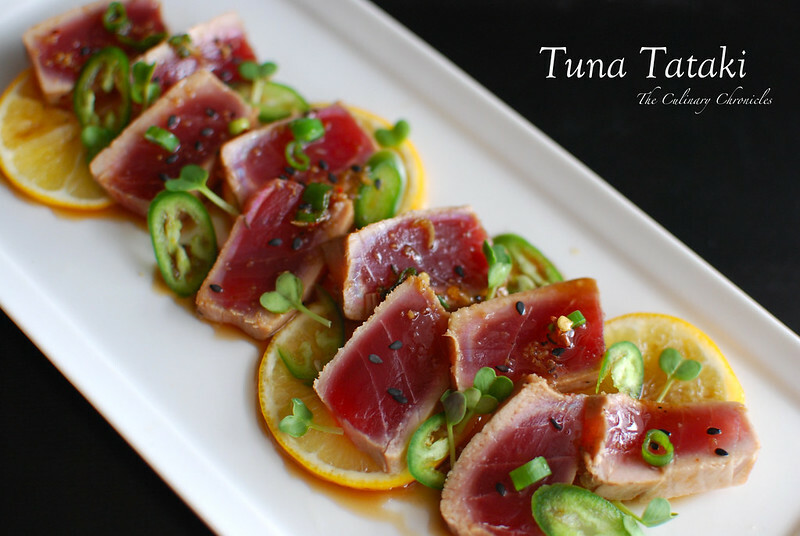 Plate the tuna on top of the thin lemon slices. Place the jalapeno/serrano peppers and pea shoots on top and sprinkle the scallions and toasted sesame seeds over the fish. Finally, take the reserved marinade (not the liquids the fish was in) and drizzle over the entire plate. Previous Post Sunday Family Dinner goes back to Japan! I seriously went out today and bought all the ingredients I didn’t have in order to make this……Sadly, my gorgeous fillet of tuna will have to wait until tomorrow Ö but tomorrow it will be for lunch instead of dinner. I can’t hardly wait! Thanks so much for sharing! I saw the photo on Pinterest and had to check out the recipe. If I can get some good quality tuna I am definitely going to try it out. Thanks for the recipe and the mouthwatering photos.